The Ghost Rider is back. Nicolas Cage (The Sorcerer’s Apprentice) donned his blazing skull (okay, not really, that’s visual effects) for Ghost Rider: Spirit of Vengeance. In the 2011 fantasy movie, Cage’s Johnny Blaze is hiding out in a remote part of Eastern Europe, until a secret sect of a church recruits him to save a young boy from the devil. At first reluctant to use the power of the Ghost Rider again, Johnny finally agrees in the hopes of also ridding himself of the curse. Ciaran Hinds (Tinker Tailor Soldier Spy), Idris Elba (Takers) and Anthony Head (TV’s Merlin) also star in the action film, which was directed by Mark Neveldine and Brian Taylor, the team behind Gamer. 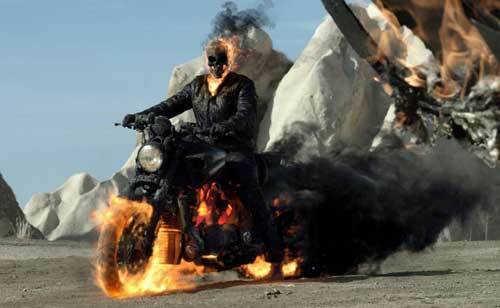 Based on the Marvel Comic, this second Ghost Rider wasn’t nearly as appreciated in theaters as the original. Whereas Ghost Rider scored $115.8 million, Spirit of Vengeance grossed only $50 million with pretty scary reviews from critics and moviegoers alike. New York Daily News‘ Elizabeth Weitzman’s reaction to the action film was, “Whether Cage is still paying off castles, appeasing the IRS, or rebuilding his comic book collection, it’s clear he has decided, for now, to trade his talent for cold, hard cash.” Ouch! New York Times critic Neil Genzlinger did have some praise for the movie, saying the presence of Elba is a redeeming quality. All disc versions have UltraViolet, which allows the movie to be downloaded or streamed, and special features.